PGSM. Item. ジュエリスターブレスレット Bracelet worn by Sailormars, Sailormercury, Sailorvenus, and Sailorjupiter. It is used during transformations. 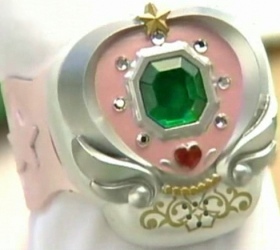 The center jewel is the senshi's main color and the surrounding material is pink and white. PGSM. Transformation. ジュピター・パワー・メイクアップ Transformation phrase used by Kino Makoto to transform into Sailorjupiter. It first appears in Act 6 and is used throughout the show. PGSM. Attack. ジュピター・サンダー・ボルト Attack used by Sailorjupiter in the show. She uses the Sailor Star Tambourine and aims lightening bolts at the enemy by sending streaks of lightning and energy from her hands. First used in Act 26.